One of the major advantages of capitalism is the constant, nagging impulse to buy stuff. And lucky for you spendy Americans out there, Amazon is leveraging its purchase of Whole Foods once again, making it easier than ever to purchase things impulsively. You’ll soon be able to buy Amazon products in Whole Foods parking lots. Just like you’ve always wanted! The new initiative represents a predictable iteration of Amazon’s Treasure Truck gimmick. 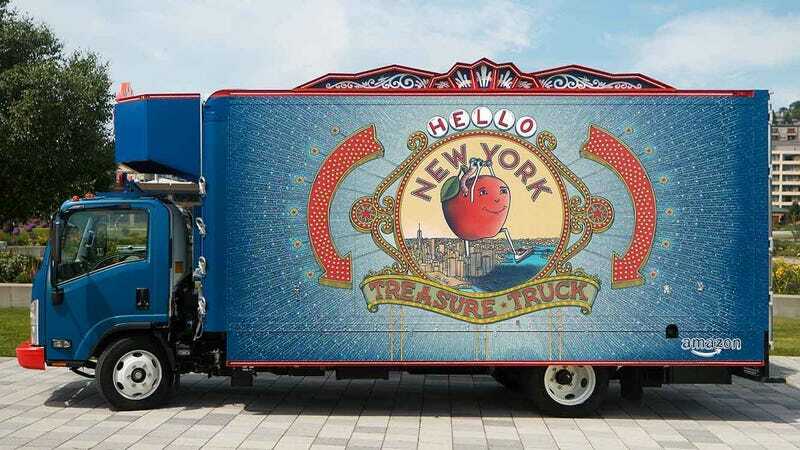 The Treasure Truck has been around since 2016, and the pop-up business model is simple yet whimsical. The truck pulls up to a location. Amazon texts people who have signed up to get alerts about deals. Then those people can buy the deal in the app, and then rush to that location to pick up that special something they probably hadn’t even planned on buying. But who doesn’t love a good deal?! The first Treasure Truck deal involved Amazon selling GoPro Hero4 action cams on a ski mountain at a 64-percent discount. The new Whole Foods integration sounds like a slightly more convenient version of the old Treasure Truck popups. Now, in addition to showing up at random locations, Treasure Trucks will park in Whole Foods parking lots, where they will sell stuff that Amazon could ostensibly sell inside of the grocery store. But everybody loves a pop-up shop with a fun, carnival-like twist, especially when there are deals involved! The first Whole Foods Treasure Truck deal will be an Instant Pot Duo Mini Pressure Cooker. If you buy a pressure cooker you get $10 off a Whole Foods purchase of $40 or more. In the New York market, would-be Treasure Truck shoppers also got 30 percent off the pressure cooker. This isn’t the first time Amazon has flexed its capitalism-loving muscles on Whole Foods’ turf. The company offered its first Whole Foods deal for Prime Members over Thanksgiving and has been selling its line of Echo smart speakers in the produce section of the grocery stores for months. We can surely expect to see more Amazon-powered deals in Whole Foods stores as the corporate synergy mounts. Heck, maybe Amazon will even fire all the cashiers at Whole Foods and replace them with robots like it’s done with its Amazon Go convenience stores in Seattle. Adam Smith never said the invisible hand was kind.